WHICH WATER PURIFIER IS THE BEST? 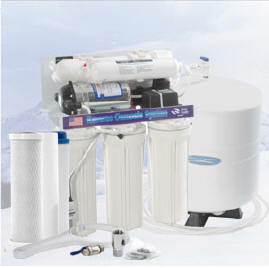 I have been involved in the water purifier business for over 40 years, and have sold almost every type and many brands. Read on as I compare water systems based on this experience, which has led me to the following analysis. First of all, home water purification is far superior to buying bottled water. The standards for bottled water are no greater than for tap water, which is often the source of bottled water. In fact, some bottled water is just city water with no purification at all. Also, plastic from the bottle leaches into the water, worsening the longer it is in the bottle. A report by the U.S. Environmental Policy Institute disclosed that its product testing shows that bottled water "frequently" contains low levels of contaminants, such as heavy metals and solvents, either due to an inferior water filter, or poor maintenance of equipment. A home water purifier is both practical and economical. Choosing among water purification systems can be confusing due to the several types and many brands offered. Each company claims theirs to be the best and parades the features and benefits of their units. A water purifier comparison is helpful in making a choice. For many years, granular activated carbon (GAC) has been the most commonly used medium for home and industrial water filter applications, effectively removing chlorine, odors, bad taste & color from tap water. Most water filter systems use GAC even today. While GAC is an excellent means of organic pollutant removal, it is unable to cope with bacteria problems. In some instances silver impregnation has been utilized in an attempt to prevent the common problem of bacterial growth in the carbon filter, with questionable results. Granular carbon will remove chlorine, bad taste, odor, color and organic compounds from water, but it is not effective against metals and other inorganic pollutants. Solid carbon, a block of carbon formed under high pressure, can remove some things that granular carbon cannot. However, carbon technology, by itself, has become overwhelmed by the enormity of the pollution and other contamination problems we face today. Nonetheless, carbon remains an essential component of water purification because of its unique pore structure and adsorptive quality. Because of the microscopic caverns throughout activated carbon it is able to hold a great amount of contaminants. A small amount of activated carbon is equivalent to a large surface area. But to deal with today's level of contaminants, carbon needs to be combined with other media. For example, granular carbon combined with sub-micron filtration (ceramic or solid carbon block) will accomplish much greater removal of contaminants than carbon alone, including bacteria, parasites and heavy metals. Many purists believe that distillation plus carbon, deionization plus carbon, or reverse osmosis plus carbon are the ultimate choices in water purification. The combining of carbon with redox media (KDF - Kinetic Degradation Fluxion, or ERA - Eagle Redox Alloy) represents a major technological breakthrough in affordable water filter systems, and is perhaps the best industry news of the last 50 years. Redox - A Significant Breakthrough! In 1987, an exciting breakthrough technology for water purification was discovered. Developed and designed by a leading American scientist, this advanced system of redox media was called "Kinetic Degradation Fluxion" (KDF). It was awarded both U.S. and International patents. The redox media (KDF, Eagle Redox Alloy) process is an all natural electrochemical reaction in which the "dissimilar" metals copper and zinc are used to create a kinetic charge from the flow of the water through them, that kills microorganisms and alters or removes many problem contaminants. It also conditions water with a "softening" effect. Redox media has been proven to be the best way to remove major contaminants from our water, and shown to stay active longer than any other purification method. The result is better water than bottled water, at a fraction of the cost. In August, 1992, KDF, the original redox media, was awarded the U.S. E. P. A. 's approval as a "pesticidal device", which means it has the ability to kill algae, bacteria (including Pseudomonas florescens, Ybrio cholera, Legionella pneumophilia, and coliforms), fungus, mold, and many parasites and viruses found in drinking water supplies, through the natural process known as "electrochemical oxidation/reduction". Redox media has also been certified by independent water purification authorities to kill a target bacteria within the "less than 1 minute contact time" required to be effective in point-of-use water filters. Thus it is "bacteriacidal", a much preferred classification to that of "bacteriostatic", a term often used with filters impregnated with silver, which only slightly retards bacterial growth. When this redox technology is combined with high-quality coconut shell granular activated carbon (GAC), the result is truly revolutionary. The redox media protects the carbon from rapid exhaustion with chlorine by handling the chlorine first, thus allowing the carbon to have a much longer effective life. Redox media itself has TEN TIMES or more the length of life of activated carbon that is not protected like this! Redox and carbon working together are proven effective against microorganisms, chlorine, heavy metals, (aluminum, arsenic, cadmium, iron, lead, mercury, etc. ), hydrogen sulfide, nitrates, odor, poor taste, THM's, PCB's, dioxin, and thousands of other organic chemicals and inorganic poisons, for an extended time, . . . at the minimal cost of approximately one cent per gallon! Even more effective purification is provided by following the redox and carbon with a solid carbon block, ultrafiltration or a ceramic cartridge. Any of these filters out smaller particles. The Ultrafiltration membrane screens down to .2 microns, and will remove most of any parasites and bacteria which may be present in water. Most of these that survive the chlorine are killed by the redox, but it is still desirable to remove them. NOTE: Redox media is a relatively expensive substance. Our water purifiers have the substantial amount of redox alloy needed to do a thorough job. There are other brands, some with the same kind of housing as ours, that contain only a small amount of redox media so they may say they have it. These will do a lesser job for a shorter time than ours. Distillation is the process of capturing re-condensed steam from boiling the source water. Small home distillation systems usually cost $300-$400. If done properly, the resulting distilled water is very pure. It is essential to use carbon as a follow-up, especially with chlorinated water, because chlorine and some other chemicals in the water will be heated into gas and travel with the steam. The carbon will remove most of this chlorine and other volatile organics. The main drawbacks of distillation are the lack of minerals (see below) and the consumption of electricity. Deionization uses a resin to remove ionically charged contaminants. It is also important to accompany the resin with carbon for the additional chemical removal that carbon provides. It is not unusual to spend $350-$400 or more, for a good deionizer. Deionized water also has a low mineral content. and it does not remove all the chemical contaminants. Reverse Osmosis (RO) is a specialized type of screening of water contaminants using a fabricated membrane. "Osmosis" is a term you may remember from biology referring to the passage of a substance through a membrane from a solution of greater concentration to one of lesser concentration. Reverse osmosis is forcing water under pressure through a membrane, which excludes substances with a molecular structure larger than the pores of the membrane. 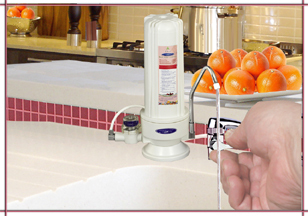 A home reverse osmosis unit operates from the source water pressure. A unique feature of reverse osmosis, compared to standard water filter methods, is that the molecules of water actually enter and become part of the membrane as they pass through. The membrane also allows oxygen through, as well as some other elements with a very small molecular size, including some colloidal and sub-colloidal minerals. The pores are small enough to screen out bacteria and even some viruses. Still, some small molecule contaminants can make it through, so a reverse osmosis unit should always include other types of media such as redox media to eliminate chlorine, biologicals and metals, and carbon to catch any organic chemicals. Prices on quality RO units run from $170-$800, depending on style and features. Most reverse osmosis membranes are of the Thin Film Composite (TFC) type. A Cellulose Acetate (CA) membrane may be used in special situations. Since sediment can clog a membrane, a sediment pre-filter is often included. Chlorine can also harm membranes. With chlorinated water, reverse osmosis requires a carbon or redox pre-filter to protect the membrane's longevity. Reverse osmosis units are susceptible to the growth of bacteria and mold within them when not in regular use. These agents can attack and ruin a membrane, resulting in contaminated water coming through. Redox media preceding the membrane will help prevent these microbes from getting to it. Frequent use of the unit will reduce the potential for bacteria or mold to get a colony started. A low bacterial count in the source water is also important. Reverse osmosis water actually has an increased oxygen concentration, as O2 has a small enough molecule to cross the membrane. RO water also contains small quantities of colloidal and sub-colloidal minerals. However the reverse osmosis process removes most of the minerals from the water. Mineral devalued water may draw minerals from the body when consumed regularly. Further, the pH of RO water is usually too acid for the human body. For this reason, it is recommended that a "Corrected Water" re-mineralizing alkalizer unit be added to correct these problems making our "Corrected Reverse Osmosis" the best choice in home water purification. CLICK HERE for information on "corrected" reverse osmosis systems. The water resulting from distillation and deionization is so devoid of mineral content that it becomes aggressive in drawing up minerals. This can result in a significant mineral loss from the body which must be compensated for by adding utilizable supplementary minerals to the water or to the diet (which I recommend for anyone, in any case). Also, these methods result in water that is too acid for biological systems. Distilled water is also practically devoid of free oxygen, an important beneficial health factor. There are those who would suggest that water is not a dependable source of all the minerals required for nutritional purposes, as the mineral content may vary from place to place, and even from the same source over time. This is true, however some people get more mineral value from their drinking water than from their food intake today, because of poor diet and the mineral deficiency of agricultural soils due to overworking without restoration. Further, the body needs the sub-colloidal minerals in water to accomplish certain electrical transmissions throughout the system. The net loss of minerals from the body due to consuming mineral devalued water can have a significant long term negative impact on health and longevity. It is recommended that our "Corrected Water" remineralizing alkalizer be included with a reverse osmosis unit. NOTE: In recent years there has been an influx of expensive water alkalizing equipment originating in Asia. These units are considered medical devices. The consumption of water that is TOO ALKALINE is just as unhealthy as water that is too acid. There is a drug-like effect on the body that may bring short term improvement, but which is harmful in the long run. Our "Corrected Water" re-mineralizing alkalizer brings the water pH to neutral or slightly alkaline, as it should be. This has a very low cost, especially when compared to the expensive and harmful Asian alkalizing systems. While truly purified bottled water may be an improvement over chlorinated tap water, any onsite point-of-use or point-of-entry water treatment with a well-maintained system would be preferable over bottled water, which is clearly unreliable and expensive. With point-of-use purification you know what you are getting, and the cost per gallon is vastly lower than with bottled water. We have sought to compare water purifiers of the most common types. The comparison above should help clarify the relative merits and deficiencies of the various methods of water purification. For their lack of minerals and other reasons, distillation and deionization have serious drawbacks. Further, distillation and reverse osmosis are inefficient in their use of resources. Reverse osmosis produces a substantial amount of discharge water. This water flushes away the contaminants rejected by the membrane. Distillers not only flush a lot of water, but most require a good amount of electricity to operate. Distillation and deionization require frequent attention to maintenance. Reverse osmosis and filtration systems need maintenance only periodically, but this should not be overlooked. No purification method works well if not well-maintained. Maintenance is most important, because if people do not keep up with replacement of exhausted pre, primary and post filters, RO membranes or de-ionizing resins, the water quality will be quite poor, often before it is recognized by the consumers. For this reason, it is recommended that a date card or sticker be placed on the unit at each cartridge change to help determine the appropriate time for replacement. The combination of redox media and carbon is an affordable alternative for home water purification. Redox media and carbon in combination maintain their effectiveness longer than de-ionizing resins or carbon alone, reducing the likelihood of drinking contaminated water from failure to change cartridges in time. The reverse osmosis systems we offer have redox and carbon included for the important work they do. Redox assists the carbon and they both protect reverse osmosis membrane from deterioration. For the cost-conscious individual who is interested in protecting their health, redox technology combined with high-quality coconut shell granular activated carbon offers an attractive water purification choice when it comes to quality, value, and maintenance-free performance. Countertop, under-the-counter and shower units are available at modest cost. NOTE: A cartridge that contains redox alloy and a special media for thorough removal of fluoride from city water, using a flow-through filtration system, is available for our standard "Heavy Duty" units. For the ultimate in affordable contaminant-removal, corrected reverse osmosis provides the best of all solutions: the very high quality purified water you want, . . . conveniently at home, . . . at a low affordable cost, . . . with a minimum of service & maintenance. We offer multiple choices for good water purification, including both "corrected" reverse osmosis units, and advanced filtration systems, all centered around redox media ("Eagle Redox Alloy" or KDF) because of its unique properties, effectiveness and affordability. All components are free of BPA. NOTE: Redox alloy is a relatively expensive material. Our purifiers have the substantial amount of redox media needed to do a thorough job. There are other brands, some with the same kind of housing as ours, that contain only a small amount of redox media so they may claim to have it. These will perform less well and for a shorter time than ours. Our redox and carbon water filter cartridges do a great job for one to two years depending on the volume and type of water processed. The larger the family, or the dirtier the water, the sooner you would change the cartridge. Clean your water of bad taste and odor, chlorine, volatile organic chemicals, heavy metals, agricultural poisons, drugs, lime and scale. Our revolutionary processes effectively clear more household water chemicals and other water problems than other types of water treatment. The pure, high-pressure solid carbon block in our filter systems will remove particles as small as 5 microns, eliminating even most bacteria. The ultrafiltration cartridge used in some of our systems has an extra fine screening ability of .2 micron. The reverse osmosis units screen down to a sub-micron size so small that there is thorough removal of chemicals, microorganisms and even radioactive particles. We have several systems that remove the toxic fluoride added to most cities' water supplies, supposedly for dental benefits. Those wishing to use it for their teeth can use fluoridated toothpaste and mouthwash. You should not be drinking this toxic chemical. Our unique reverse osmosis systems have the option of including a "Corrected Water" cartridge to improve water, which may otherwise be too acidic. This re-mineralizing alkalizer is an option with any of our systems to correct water with reduced mineral content or pH below 7. Our Corrected Water cartridges "energize" the water as well, by conditioning it with minerals and Far Infrared energy. The resulting water is ideal for functionality in the body. The water performs better at doing the things that water does. Current prices for our complete line of quality point-of-use kitchen water purifier systems range from $29.95 for a water purifying pitcher or $79 for a single counter top unit to $363 for a "Max" Fluoride Removal under counter corrected reverse osmosis system. All of our drinking water purifiers have replaceable cartridges. We also have whole house systems. NOTE: For those on fluoridated city water, our special flow through units for fluoride removal, or our reverse osmosis systems will thoroughly eliminate fluoride. All of our drinking water purifiers have replaceable cartridges, and clear installation instructions. CLICK HERE for "Corrected Water" re-mineralizing alkalizer units. Copyright 2004-2019 by Natural Health Enterprises -- All rights reserved.